Dozens of imposing factories, glorious houses of worship, handsome schools, and majestic skyscrapers stand as fixed monuments of the lives, loves, and obsessions of two of Detroit’s greatest architects: Wirt Rowland and Albert Kahn. During the first half of the 20th century, Detroit was transformed by dramatic economic expansion, explosive population growth, and the vision of these two men. Join Detroit History Tours on this remarkable journey into the city's history as evidenced through the buildings of Kahn and Rowland. Together with your brilliant guide, you’ll traverse the inner sanctums of privately owned buildings, gaze at the ever rising tops of skyscrapers, and see the factories that built the Motor City’s motors. You’ll learn the identifying styles of both architects, how Detroit invented the modern factory, and why Detroit is largely responsible for the rise of "art deco" design. We’ll track their work through factories that gave birth to the automobile, great skyscrapers born of the prosperous 1920’s, and lesser-known banks, schools, churches, homes, and stores that composed the fabric of everyday life in Detroit. From wealthy estates to members only clubs, bank vaults to horsehair ceilings, columns to cornices, pharmacies to bars, and the resident’s, workers, and owners who walked the hallowed halls of them all, it promises to be an afternoon of architectural delights. This tour is conducted by the talented Michael G. Smith. Michael is a Detroit-area architecture historian with an interest in early twentieth-century building and construction. His lifelong enthusiasm for the fine arts led to an early career as a graphic artist and, more recently, he conducts research and provides photography services for local real estate developers. 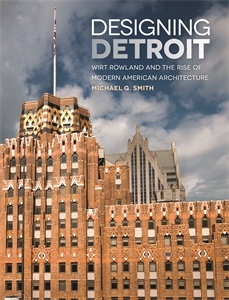 He is the author of Designing Detroit; Wirt Rowland and the rise of Modern American Architecture, and a number of articles on Detroit's architectural history. Designing Detroit was a winner of the Michigan History Award, selected as a Michigan Notable Book, and a Forward INDIES silver medal winner in the architecture category. Copies of his book will be available for sale following the tour for 40.00 dollars or can be found on Amazon. This tour leaves promptly at 12:30 pm from Bethel Community Transformation Center (Formally Temple Bethel) 8801 Woodward Ave, Detroit, MI, 48202. Private gated parking is available for no charge. Parking is at your own risk. Parking is and bus check in will be available starting at 12:10 pm. This tour is suitable for ages 16 years old and up. Guests must be able to walk two city blocks, climb one flight of stairs, and stand comfortably for twenty minutes. A small snack and beverages will be provided at no charge. We suggest eating before the start of the tour as meals will not be available at any stops.